Reload/Refresh (F5) to make sure you see the latest listings. Carla Sue (Krieg) Shelton, 53, of Osgood passed away at 1:24pm, Tuesday, April 16, 2019 at Christ Hospital in Cincinnati. She was born at the Bartholomew County Hospital in Columbus on April 3, 1966 the daughter of Kenny and Betty Luers Krieg. She was married to Andy Shelton on February 11, 2018 and he survives. Other survivors include her parents Kenny (Kathy) Krieg of Vevay, and Betty (David) Forkert of Dade City, Florida ; two sons Jesse Grow of Milhousen, and Luke (Brianna) Grow of Napoleon; one daughter Maggie Grow and her companion Brandon Jeffries of Sunman; two brothers Nate (Bridget) Krieg of Napoleon, and Dwight (Laurie) Krieg of Batesville; two step-sisters Amber (Eric) Peetz of Batesville and April (Jeremy) Hughes of Osgood; many nieces, nephews, great-nieces and nephews, aunts, uncles, and several cousins. Carla was proud to know that she was becoming a grandma in October. She was preceded in death by her grandparents Carl Luers, Ruth Tatem, and William and Matilda Krieg. Carla was a 1984 graduate of Jac-Cen-Del High School. She was a compassionate person who had a continuous smile that could light up a room. She was an active member within the medical field, receiving her First Responder certification in 2005 and her EMT certification in 2008. She loved to help her community and volunteered at Task Unit One until it closed and then became a member of the Napoleon Fire Department. Carla was an employee of Margaret Mary Health in Batesville. She had previously worked for 26 years at the office of Dr. David Welsh in Batesville while working part time with the Ripley County EMS. Carla was a member of the Hopewell Baptist Church. Funeral services will be held on Tuesday, April 23rd at 10am at the Hopewell Baptist Church with Pastor David Forkert officiating. Burial will be in St. Peters Cemetery at Fink’s Corner near Napoleon. Visitation will be held on Monday, April 22nd from 5pm to 8pm and will also be held at Hopewell. There will also be visitation Tuesday from 9am until time of services. Memorials may be given to the donor’s choice in care of the Stratton-Karsteter Funeral Home in Versailles. Betty Lou Bustle, 78, of Dabney passed away at 1pm, Monday, April 8, 2019 at her home. She was born near New Marion on June 28, 1941 the daughter of Clyde and Goldah Wilson Curran. She was married to Dean Bustle on April 1, 1958 and her husband of 61 years survives. Other survivors include four sons Gary (Margaret) Bustle of Fargo, North Dakota, Mike (Michelle) Bustle of Commiskey, and Mark Bustle and Brian Bustle both of Dabney; one daughter Terri Smith of Independence, Kentucky; 11 grandchildren and 13 great-grandchildren. She was preceded in death by her parents, her son Ricky, her brother Charles Curran, and her sister Ruth McHenry. Mrs. Bustle was a homemaker and a former employee of Hopkin’s Store in Holton. She enjoyed her large family and also spent time doing puzzles, sewing, quilting, crocheting, and playing bingo. Betty was a member of the Holton Christian Church. Funeral services will be held on Friday, April 12th at 12pm at the Stratton-Karsteter Funeral Home in Versailles with Bro. Bob McCreary of the Holton Christian Church officiating. Burial will be in the New Marion Cemetery. Visitation will also be on Friday beginning at 10am. Memorials may be given to the New Marion Cemetery in care of the funeral home. 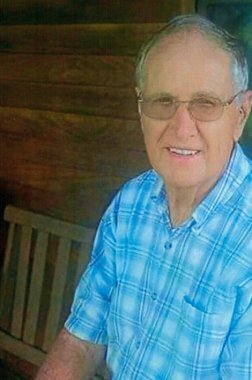 Dale M. Hyatt, 76, of Osgood passed away at 7:52pm, Sunday, April 7, 2019 at the Manderley Health Care Center in Osgood. He was born at Batesville on September 14, 1942 the son of Edmond and Hilda Lewis Hyatt. He was married to Ruth Adams on April 26, 1970 and she survives. Other survivors include one son Benji Hyatt of Dover. Mr. Hyatt was a 1961 graduate of Jac-Cen-Del High School. He was a former employee of Gulf Plastics in Greensburg and had also been a truck driver for Crum Farms. Dale had also operated a TV repair shop in Osgood and had served as Ripley County Building Inspector for several years. Funeral services will be held on Saturday, April 13th at 12pm at the Stratton-Karsteter Funeral Home in Versailles. Burial will be in the Tanglewood Cemetery. Visitation will also be on Saturday beginning at 10am. Memorials may be given to the Tanglewood Cemetery in care of the funeral home.